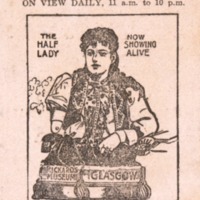 The Britannia Music Hall had already been open for half a century on Glasgow’s Trongate by the time A. E. Pickard took it over. Under his management, the Britannia reopened in July 1906, now called “the Britannia Theatre of Varieties and Grand Panopticon” and incorporating a museum, freak-show and zoo. Presenting four shows daily, at 2pm, 4pm, 7pm and 9pm, the Panopticon was a prime music hall venue, at a time when that form was thriving. 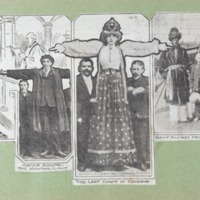 The scrapbooks give valuable insights into the music hall business in Scotland, as Pickard kept an eye on the competition and documented his own publicity. Acts booked for the Panopticon included singers, dancers and comics, while the Museum, in addition to its permanent displays and topical waxworks, featured novelty acts of a more bizarre nature. 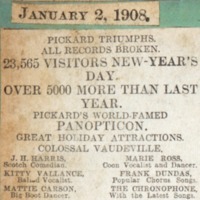 Some of these acts attracted significant press coverage, like Victor Beaute, whose attempted fast for 46 days is followed up in Pickard’s early scrap-books. For 39 days from the 1st October 1906, Beaute claimed to have lived off soda water and cigarettes, losing close to two stones in weight. Reading these early clippings, one can trace the decline of Beaute’s attempt, as he was first abandoned by medical professionals then blocked by the police and procurator fiscal. Whether motivated by continued fascination or regret at a missed opportunity, Pickard continued to trace Beaute’s progress until he broke the 40 day record for fasting at the rival Stewart’s Waxworks in Edinburgh in April 1907, where he fasted for 48 days. Later that year, a Glasgow athlete set a world record in club swinging, by juggling the Indian clubs for over twelve hours a day over six days. People who were unusually small or large, along with the Half Lady, the Bear Woman, and the Man in a Trance all joined the ‘one million novelties’ promised to patrons. Certain performers seem to have made welcome returns to the Panopticon over the years, like Lady Empress, who in January 1908 was said to “escape from, for example, a strait-jacket and from a packing-box securely screwed and nailed”. Apart from such talented humans, Pickard also had an interest in exotic or performing animals, for the stage and the menagerie. One of the scrapbooks documents the sale of Bostock’s Zoo in 1909, when hundreds of animals were auctioned. Behind these individual stories, the scrapbooks show the gears of popular entertainment turning, with disputes over contracts, fears of monopoly, and changes in licensing law all being documented. 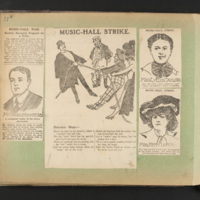 A significant event in music hall history, the music hall strike of 1907, is covered extensively within the scrapbooks with a range of contemporary viewpoints expressed, including those of major pro-strike stars like Marie Lloyd and Harry Lauder. The career-threatening consequences of not supporting the strike are underlined by an article from The Performer: “By Their Deeds Ye Shall Know Them,” naming and shaming “turns that have worked proscribed halls during the strike, in direct opposition to the wishes and requests of the Executive Committee”.